Skate Bag Classic is a modern bag with a retro Rollerblade color combination and logo for storing and transporting skating equipment. The boot shaped bag conveniently holds skates and provides additional internal storage for protective gear or other items. The accent colors are reversed on the other side to have the appearance of two bags in one. 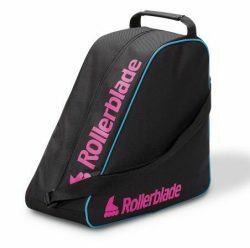 This bag is liked by many skaters because it reminds them of one of their first skates they learned on and has a nostalgic feel with modern applications. The YKK zipper opens the center panel to access the bag and internal pocket with an accented zipper to easily find the smaller items that are stored. In addition the mesh panel on the rear of the bag lets any sweaty or dirty items air out to help reduce odors. The bag can be carried with the shoulder strap or the tote handle and the base of the bag has a reinforced base and peg feet to make the bag stand up on its own for convenience or avoiding dirty surfaces.